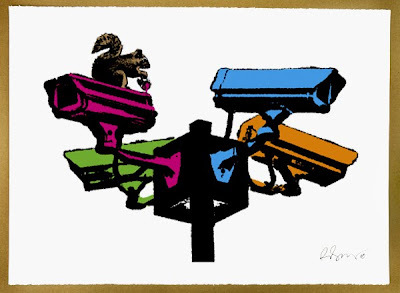 This new print by Rene Gagnon, titled "CCTV", comes in an edition of 50 for $140. The print is 1 color silk screen 5 color hand spray on 22 inch X 30 inch 250gsm paper - handmade by Rene. Signed, dated, numbered, embossed, includes COA. I'm feelin' the squirrel.